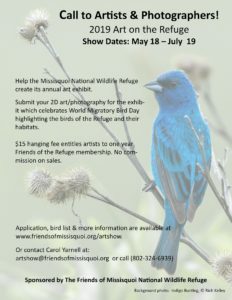 Volunteers Needed at Missisquoi National Wildlife Refuge! 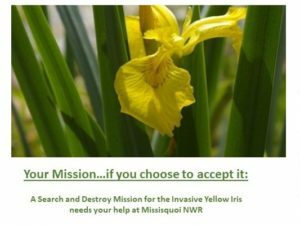 Missisquoi NWR needs your help in a Search and Destroy Mission of the Invasive Yellow Iris! The Target: Missisquoi National Wildlife Refuge contains the largest intact silver maple-sensitive fern floodplain forest in Vermont. Not only is it vital for some of the state’s threatened and endangered species (bald eagles, rusty blackbirds, little brown and tri-colored bats, spiny softshell turtles), but it’s important for other migrating and breeding wildlife (wood ducks, osprey, great blue herons, Neotropical migrant songbirds, blue-spotted salamanders, wood frogs, white-tailed deer), as well. The Threat: In recent years, Missisquoi’s floodplain forest has been under attack by a sinister saboteur, the Yellow Iris. Warning: Do not be fooled by this plant’s beautiful yellow flowers! Unlike Vermont’s native blue iris, this intrepid invasive silently spreads to out-compete native plants. If left to its own devices, Yellow Iris won’t stop until it’s the only plant around, creating an unhealthy and less diverse ecosystem, with little value to wildlife. Being located at the lower end of the massive Missisquoi River Watershed isn’t easy. The refuge’s floodplain forest gets bombarded with floodwater from upstream sources. Although the flooding transports much-needed nutrients to the forest floor, it also brings threats, including the roots, stems, and seeds, of invasive plants! The floodwaters eventually recede, but the invasive plant parts usually succeed, and happily make the refuge their new home! Why is this Mission Critical? Missisquoi’s floodplain forest is in imminent danger. A hostile takeover, by the invasive Yellow Iris, is happening right before our very eyes.The time has come to thwart this adversary! Your help is needed to stop Yellow Iris in it’s tracks, by marking flowering plants now, so a herbicide treatment can be done in the fall. HOW: Volunteers are needed to walk the refuge’s floodplain forest, and mark all flowering Invasive Yellow Iris. Caution:This is not for the faint of heart! Walking long distances, on uneven ground, through vegetation, and possible standing water, may be involved! Rubber boots and bug repellent may be necessary. WHEN:May and June, 2019. Yellow Iris is difficult to distinguish from native blue iris, unless it’s flowering. When the flowers start to bloom, we’ll start to search! The control and containment of Yellow Iris, and other invasive plants, is a PRIORITY in maintaining healthy and diverse habitats for wildlife, at Missisquoi National Wildlife Refuge. Please join us, if you can.